Slightdifferences in the colour tone of the website's photo and the actual item. hope you can understanding, will be sincerely appreciated. We will be glad to reply and help you to solve any problem. Type:Cookie Tools. Material:Stainless steel. Color:As picture. 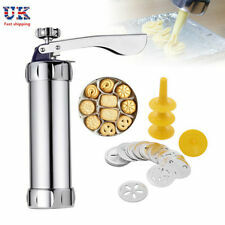 25pcs Biscuit Maker Cookies Press Cake Decorator Pump Machine Kit Syringe Gun. • 20 Cookie Discs. • Easy Grip Die Cast Ring Nut. • Machined Steel Piston Rod. • Strong Dough Piston. Colour Recipe & Instruction booklet included. *Retail Gift Boxed with Cookie Recipe*. Type:music note biscuit mold. Material: plastic. 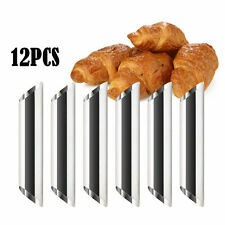 UK 9Pcs Mini Stainless Steel Multi Shape Cake Cutter Kids Vegetable Fruit Pie Mould. Super value biscuit knife suit:Nine different shapes and sizes,including rabbits,bears,strawberries,mushrooms,stars,love,flowers,lace. Puzzle biscuits shape is very special, you can play from the production of. be the shape of the puzzle. When you finish puzzles of cookies, can also. biscuits, just to change the mold on the flour above, gently press, there will. 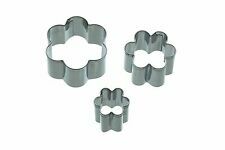 These cutters are ideal for use with Cookies, Fondant Cakes, sugar paste, petal paste, marzipan DIY cooking or craft clays. 1 Set Alphabet letter cookie Cutter. Let place fixing tool press at the fondant/cookie to print your design contents on the fondant/cookie. COOKIE CUTTER UNICORN HEAD SHAPE. UNICORN PARTY. UNICORN PARTY RANGE. DISPATCH INFORMATION. Brand New and Quality 4X Easter Egg Rabbit Cake Fondant Plunger Cutter Cookies Biscuit Pastry Mold DIY Material: Plastic Color:Random These cutters are ideal for use with Cookies ,Fondant Cakes, sugar paste, petal paste, marzipan DIY cooking or craft clays. Great for cutting cookies and fondant accents too. Includes 6 classic plaques, perfect for monograming. 6 stainless steel plaque cutters. 11.5 x 9 cm and smaller cutters approx. We reserve the right to refuse service to anyone. (3) Suitable for candy mold / cookie mold / chocolate mould / cake mold. 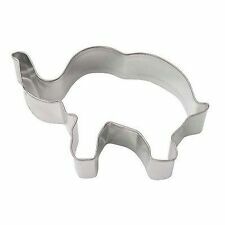 cookie cutters. (2) Made of high quality Stainless Steel---durable,reusable, healthy. Material: Stainless Steel. Hope you can understand it. Easter Cookie Cutters. 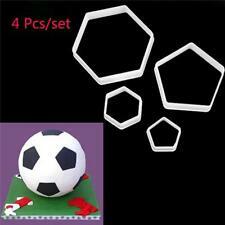 Set of 4 plastic cookie cutters. Washable & re-usable. Ideal for Cakes, Sugar paste, petal paste, marzipan DIY cooking or craft clays. 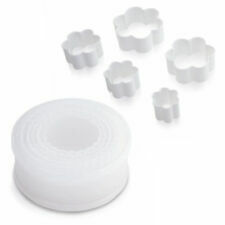 This ever popular FMM rose petal cutter consists of five sizes and is used by many cake decorators to enhance their cakes. We reserve the right to refuse service to anyone. Helpful Links. You can use it to make decorative biscuit. You can use it to make cookie,cake,bread,etc. Pattern:Round Circle Cookie. It can be sued to cut the vegetable,fruit in shape you like. Pikachu Cookie, Biscuit, Pastry, Fondant Cutter Condition is New. 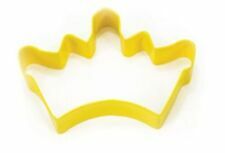 3D printed cookie cutters made from food safe pla plastic Cutting Sizes are approximately And in millimetres H55mm x W65 xD14 Ideal for cutting cookie dough,pastry,fondant even bread for that special shaped toast,ideal for party cakes (Hand——wash—only). As with most 3d printed items small defects may be visible or layer lines apparent. 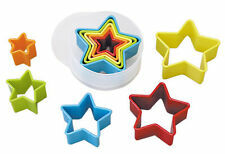 5pcs Round Circle Stainless Steel Cookie Cutter Set Pastry Cookies Biscuit Mold! Suitable for making cake,pizza,fondant cake,mousse cake,pudding,chocolate,jelly pudding,fruit pie,ect. 5x Cookie Cutter Mold. Flexible,reusable,not sticky,easy to demould,forming effect is good,used to decorate the delicious cake. The molds are good for Cookies ,Fondant Cakes, sugar paste, petal paste, marzipan DIY cooking or craft clays. This is not a toy, not suitable for under 36 months. Size: Approx. 6.5cm x 2.5cm x 1.8cm. 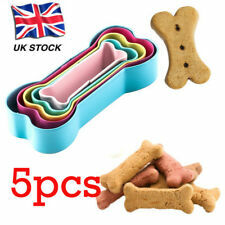 7pcs/Set Stainless Steel Biscuit Cookie Cake Pastry Fondant Mold Mould Cutter. 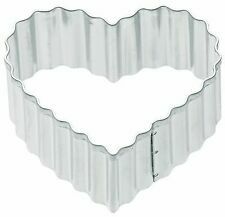 Silicone Madeleine Mould 9 Cavity/ Shell Pan/Tray/Sponge Cake Tin-Biscuits. 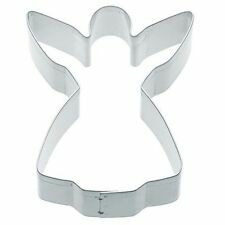 1 Set /4pcs Cake Cookie Cutters. 5X DIY Snowflake Shaped Christmas Bauble Cookie Cutters Tree Decor Kit Xmas Gift. THERE ARE 14 PCS OF TOOL KIT DOUBLE ENDED,( THE COLOURS MAY VARY ) BUT THESE ARE PINK IN THIS PICTURE. EASY TO CLEAN. EASY TO USE.